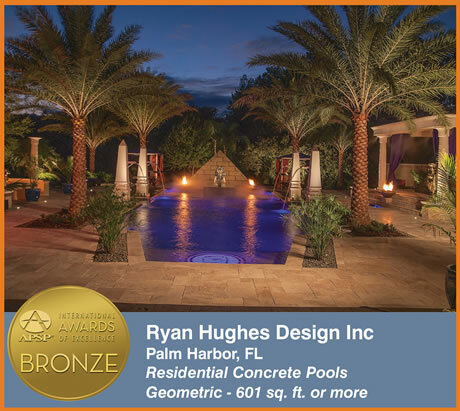 (LAS VEGAS) – Ryan Hughes Design Build will be presented four prestigious Awards during The Association of Pool & Spa Professionals’ International Awards of Excellence ceremony held on Monday, November 9, during the Chairman’s Reception, at the Mandalay Bay in Las Vegas. 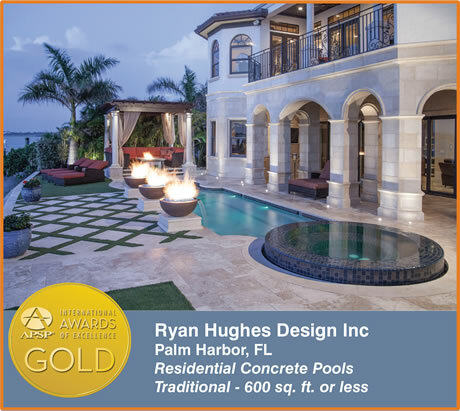 An expert in pool design and construction as well as outdoor living; Hughes and his team will be recognized with two Gold Awards and two Bronze awards. 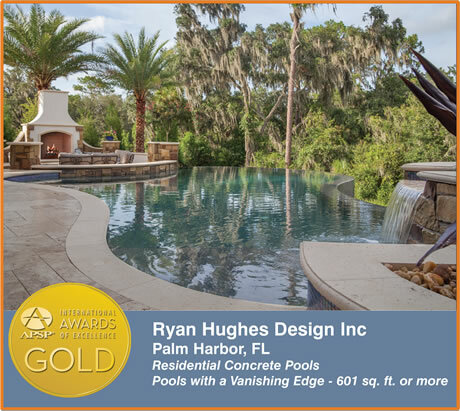 The Palm Harbor, Florida based company will receive one Gold Award in the category of Residential Concrete Pools with Vanishing Edge – 601 square foot or more. This installation, located in the Tampa, Fla. area, was designed with a weir wall beautifully covered in Zafiro – Blue Glass tile from Ezarri Mosaico. The dark bottom of the pool is Ocean Blue from Pebble Tec. The award-winning pool is the centerpiece of an entire outdoor living project that included additional water features as well as custom build fire, lounging, dining and kitchen areas. The second Gold Award, for another project in the Bellaire, FL, area, was awarded within the category of Residential Concrete Pools – Traditional – 600 square foot. or less. This project included a unique pool shape that mirrored architectural elements of the home as well as decorative interior pool tiling. 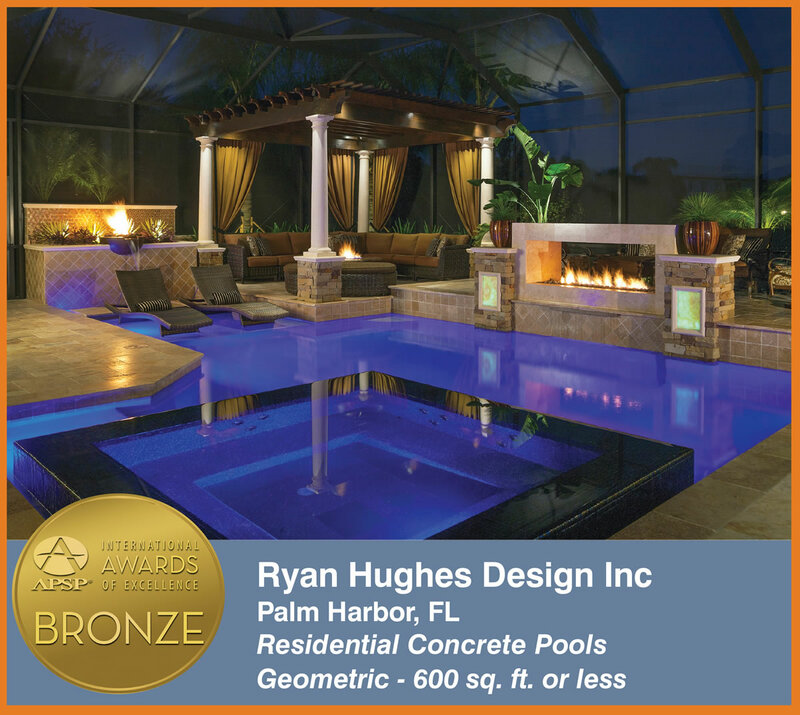 The two Bronze Awards will recognize Residential Concrete Pools in the category of Geometric – 600 square feet and less. Each pool emphasized a comprehensive outdoor design with the pool at the center designed with custom features and unique water and fire elements. The APSP International Awards of Excellence program recognizes and rewards installations of pools, spas, hot tubs, and water features that showcase the most beautiful and creative work in the industry. Hundreds of entries are submitted each year, representing member firms across the United States and around the world. This year’s winners are featured in the October issue of AQUA Magazine and the home improvement idea site Houzz. In addition to the traditional awards, APSP has added a Fan Favorite Award. You can vote for Ryan Hughes Design Build’s winning entries at APSP.org/fanfavorite, until November 10. The most popular entry will be presented the Fan Favorite Award during the 2015 International Pool | Spa | Patio Expo at the Light Nightclub on Tuesday, November 10. The Association of Pool & Spa Professionals (APSP) is the world's oldest and largest association representing swimming pools, hot tubs and spa manufacturers, distributors, manufacturers' agents, designers, builders, installers, suppliers, retailers and service professionals. Dedicated to the growth and development of its members' businesses and promoting the enjoyment and safety of pools and spas, APSP offers a range of services, from professional development to advancing key legislation and regulation at the federal and local levels, not consumer outreach and public safety. APSP is the only industry organization recognized by the American National Standards Institute to develop and promote national standards for pools, hot tubs and spas. For more information, visit APSP.org.